As a leader in the virtualization community we are excited to welcome you into the Nexenta Family. We hope you take a few minutes to explore our portfolio of the latest software defined storage products. Click on any of the puzzle pieces to learn more. As a vExpert we would like to extend a special offer to you, our partnership with VMware has been growing and our release of NexentaConnect for VMware Virtual SAN has been gaining great traction. 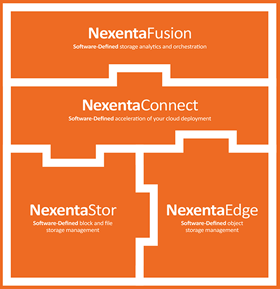 Providing file services on top of VSAN, NexentaConnect allows you to expand the software-defined hyperconverged solution. Download the software below and fill out the form with your product ID for a 1-yr promotional license for up to 8 CPU Sockets, matching the VMware VSAN 8 Socket License.